Call a method on a remote LLSDRPCServer. Client class for a structured data remote procedure call. This class helps deal with making structured data calls to a remote server. You can visualize the calls as: response = uri.method(parameter) where you pass in everything to call and this class takes care of the rest of the details. In typical usage, you will derive a class from this class and provide an API more useful for the specific application at hand. 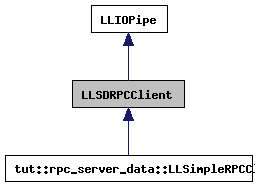 For example, if you were writing a service to send an instant message, you could create an API for it to send the messsage, and that class would do the work of translating it into the method and parameter, find the destination, and invoke call</call> with a useful implementation of LLSDRPCResponse passed in to handle the response from the network. Definition at line 134 of file llsdrpcclient.h. Enumeration for tracking which queue to process the response. Definition at line 144 of file llsdrpcclient.h. Enumeration for tracking client state. Definition at line 196 of file llsdrpcclient.h. Definition at line 120 of file llsdrpcclient.cpp. Definition at line 128 of file llsdrpcclient.cpp. uri The remote object to call, eg, http://localhost/usher. If you are using a factory with a fixed url, the uri passed in will probably be ignored. parameter The seriailized parameter to pass into the remote object. response The object which gets the response. queue Specifies to call the response on the process or callback queue. Returns true if this object will be able to make the RPC call. Definition at line 160 of file llsdrpcclient.cpp. References LLSDRPC_REQUEST_FOOTER, LLSDRPC_REQUEST_HEADER_1, LLSDRPC_REQUEST_HEADER_2, mQueue, mRequest, mResponse, mState, LLMemType::MTYPE_IO_SD_CLIENT, mURI, and STATE_READY. parameter The parameter to pass into the remote object. It is up to the caller to delete the value passed in. Definition at line 133 of file llsdrpcclient.cpp. 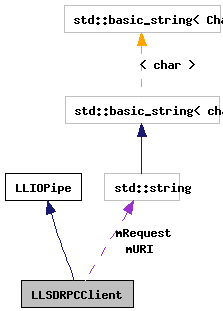 References LLSDRPC_REQUEST_FOOTER, LLSDRPC_REQUEST_HEADER_1, LLSDRPC_REQUEST_HEADER_2, mQueue, mRequest, mResponse, mState, LLMemType::MTYPE_IO_SD_CLIENT, mURI, STATE_READY, and LLSDSerialize::toNotation(). Definition at line 187 of file llsdrpcclient.cpp. References LLPumpIO::addChain(), CONTEXT_DEST_URI_SD_LABEL, DEFAULT_CHAIN_EXPIRY_SECS, EPBQ_PROCESS, LLSDRPCResponse::extractResponse(), LLSDSerialize::fromNotation(), llendl, llinfos, mQueue, mRequest, mResponse, mState, LLMemType::MTYPE_IO_SD_CLIENT, mURI, LLChannelDescriptors::out(), PUMP_DEBUG, LLPumpIO::respond(), tut::sd(), STATE_DONE, STATE_NONE, STATE_READY, STATE_WAITING_FOR_RESPONSE, LLIOPipe::STATUS_DONE, LLIOPipe::STATUS_ERROR, and LLIOPipe::STATUS_PRECONDITION_NOT_MET. Definition at line 222 of file llsdrpcclient.h. Referenced by call(), and process_impl(). Definition at line 221 of file llsdrpcclient.h. Definition at line 223 of file llsdrpcclient.h. Definition at line 219 of file llsdrpcclient.h. Definition at line 220 of file llsdrpcclient.h.